Formed from half of a double coconut palm from the Seychelles, East Indian Ocean. ‘Sea nuts’ were brought to Europe by the Portuguese from the 1550s and were valued as antidotes to poison. They quickly found their way into court collections. The Rothschilds may have added the figure of Jupiter before 1866 to ‘improve’ the object for display. Scent fountain in form of vase on high foot body formed of half a Seychelles nut mounted in silver-gilt, embossed and chased; triangular mouth edged with band engraved with scrolls and joined to foot by two bands representing allegorical female figures, winged and with double serpentine tails; spout at one end in form of monstrous animal's head; baluster stem chased with three female masks and festoons of fruit; foot, band embossed with reptiles, another with swimming dolphins; cover similar and surmounted with modern addition of Jupiter astride his eagle. Origin: Southern Germany; no silver punch-marks; perhaps Augsburg, last quarter of 16th century. Commentary: Seychelles nuts, being of the utmost rarity in Renaissance Europe, became one of the most highly prized 'curiosities' of the Kunstkammer. Their sole place of origin - two small islands within the group known as the Seychelles - lies in the Indian Ocean, some seven hundred miles north-east of Madagascar, but was not discovered by Europeans until 1768. The palm trees that produce these giant double nuts (Lodoicea Maladivica) are often one hundred feet tall and more than one hundred years old. The nut itself, frequently referred to as a coco-de-mer, can weigh as much as 50 lb and may take six years to mature. Consequently, it was scarcely surprising that, according to a much repeated tradition, the Prince of Bantam in Java presented a particularly handsome specimen to the Dutch admiral, Wolfer Hermannszen, who on his return to Europe was able to sell it in 1602 to the Emperor Rudolph II for 4,000 guilders (see E. Kris, ‘Golschmeidearbeiten des Mittelalters, der Renaissance und des Barock. I Teil: Arbeiten in Gold und Silber’, Publikationen aus den Kunsthistorischen Summlungen in Wien, Band 5, Vienna, 1932, p. 51, no. 79, pls 51-2, 86-7; A. Lhotsky, ‘Die Geschichte der Sammlungen (Festschrift des Kunsthistorischen Museums zur Feier des fünfzigjährigen Bestandes, 2 Teil, 1. Hälfte, Vienna, 1941-5, p. 252). Dr Rudolf Distelberger has recently cast doubt on this story, pointing out that the written evidence of the Inventory of 1607-11 (recording the Kunstkammer of Rudolph II) does not tally, since two unmounted nuts are there recorded as having a value of 150 guilders (Distelberger, in ‘Prag um 1600’, I, Vienna, 1988, p. 440; also p. 470, no. 340). At that time five more of these nuts - all mounted specimens - were listed in the Hapsburg inventory as “cocco de maldiva” and, indeed, one of the first published illustrations of a mounted example is a copper-engraving inscribed COCCVS DE MALDIVA , argento inclusus'. It was printed in a ten-volume botanical work by Clusius, the Netherlandish doctor and botanist (see G. Glusius (Caroli Clusii Atrebatis), ‘Aulae Caesareae quondam Familiaris, Exotocorum Libri Decem: Quibus Animalium, Plantarum, Aromatum, aliorumque . . . Ex officina Plantiniana Raphelegii’, Book VII, Antwerp, 1605). The engraving has most recently been reproduced and discussed in detail by Helmut Trnek (in ‘Prag um 1600’, II, Vienna, 1988, pp. 212-15, no. 686) in relation to the exceptional Seychelles nut fountain from Rudolph II's collection which, since 1619, has been preserved in the Schatzkammer of the Deutsches Ritter Ordens in Vienna (inv. no. 74); its distinctive silver-gilt mounts have now convincingly been attributed to a workshop of the last quarter of the sixteenth century in Lisbon, where the ships of Portuguese traders first brought into Europe these rare exotic nuts from the Indies. The contemporary term, 'cocco de maldiva', was thus derived from the Maldives, a large group of islands known to exist to the south-west of Sri Lanka (Ceylon) in the north Indian Ocean. (i) In the Schatzkammer of the Deutsches Ritter Ordens, Vienna (inv. no. 74; see Helmut Trnek in ‘Prag um 1600’, II, Vienna, 1988, no. 686; see also Fritz 1983, no. 245, pl. 128b, where the mounts of this fountain were described as gilt-bronze and tentatively attributed to a seventeenth-century workshop in Java). (ii) In the Grünes Gewölbe, Dresden (inv. no. IV, 314; see Fritz 1983, no. 240, pl. 125a, where the silver-gilt mounts of this fountain were attributed to an anonymous German goldsmith in the second half of the sixteenth century). (iii) In the Kunsthistorisches Museum, Vienna (inv. no. 68.49; see Helmut Trnek in ‘Prag um 1600’, II, Vienna, 1988, no. 687, where the silver-gilt mounts of this fountain are attributed to a South German workshop during the last quarter of the sixteenth century). (iv) In the Kunsthhistorisches Museum, Vienna (inv. no. 68.72; see Rudolf Distelberger in ‘Prag um 1600’, I, Vienna, 1988, no. 340, where the ewer, which is a signed work of the Augsburg goldsmith Anton Schweinberger, is stated to have been made for Rudolph II, most probably in 1602; also Fritz 1983, no. 242, pl. 126a, 127b). (v) In the Chancellor's Room of the University of Uppsala, Sweden (see H. Seling, ‘Die Kunst de Augsburger Goldschmiede 1529-1868’ 3 vols., Munich, 1980, p. 257, no. 241; Hans-Olof Boström in ‘En Värld i miniatyr’, Stockholm, 1982, pp. 12-48, with col. pls; Fritz 1983, no. 243, col. pl. 16, where the ewer, which is a marked work of Johannes I Lencker of Augsburg, is dated c.1630). The ewer crowns the Kunstschrank presented to King Gustavus Adolphus of Sweden in 1632. This cabinet was a miniature Kunstkammer, and for six years, between 1625 and 1631, many craftsmen were employed to produce it under the supervision of the Augsburg merchant Philipp Hainhofer. The King received it during his stay in Augsburg some six months before he was killed at the Battle of Lützen. Hainhofer received 6,000 gulden for it and the following year it reached Sweden. These five historic pieces, together with the London fountain, are apparently the only extant examples of mounted Seychelles nuts of the late Renaissance, and significantly they are all created from half a nut which has been transformed into a vessel that could hold liquid - either a fountain or a ewer. Even the ewer on top of the mineralogical 'mountain' at the summit of the Kunstschrank of Gustavus Adolphus has been designed to be removed with ease and, as Hainhofer mentioned, it holds one quarter of wine (see J. Böttiger, ‘Philipp Hainhofer und der Kunstschrank Gustav Adolfs in Uppsala’, III, Stockholm, 1909-10, pp. 50-3, 91-4). The widespread belief in Court circles at that time credited the Seychelles nut with being a highly effective antidote for poison and, no doubt, accounts for all the surviving examples being pouring vessels, such as ewers and 'fountains' (as they have tended to be called in England). Although the name 'fountain' came to be applied to those large items of silver in the form of an urn fitted with a tap that first made their appearance in England about 1670, it had previously been given to pieces serving several different purposes, including those spectacular centrepieces that burnt perfume and flowed with scented water, as in the case of the famous table fountain presented by the city of Plymouth to Charles II after the Restoration in 1660 but which had been made some years before by the Hamburg goldsmith Peter Ohr. Such grandiose pieces can be compared with three monumental Hamburg silver-gilt perfume 'mountains' sent by Christian IV of Denmark (1588-1648) to the Tsar and still preserved in the Moscow Kremlin (see C. Oman, The Civic Gifts to Charles II, ‘Apollo’, LXXXVIII (November 1968), pp. 336-40; J. I. Smirnowa and B. Heitmann, Gold und Silber aus dem Moskauer Kreml’, Hamburg, 1986,pp. 92-5; M. Bencard and G. A. Markowa, ‘Christian IVs Royal Plate and his Relations with Russia’, Rosenborg, 1988, pp. 34-6, no. 14, fig. 21). It seems, therefore, that the London Seychelles nut may have been intended for scented water rather than for drinking purposes; but the evidence at present is far from conclusive. (i) The Vienna fountain has not only suffered the loss of the finial on the cover (already described under Condition) but has lost one of its three brackets at the top of the stem (immediately beneath the calyx). Both these areas of damage have been gilded and help to confirm that the present gilding of this fountain is not original but probably dates from the nineteenth century. one solid piece that can no longer be taken apart. Such a condition is consistent with nineteenth-century practice in many repairers' workshops throughout Europe. (iii) Significantly, the design of the two remaining scrolling brackets on the Vienna fountain is more elaborate than on the London fountain, for it comprises a single satyr's leg and hoof, a torso with a projecting head and (below the chest) an oval 'shield'. (iv) Similarly, the decoration in relief on the knop of the stem of the Vienna fountain follows a different pattern, having three male grotesque masks surmounted by a lion's head - as if based on the representations of Hercules wearing the lion's skin on his head. Unlike the London fountain's three female masks alternating with swags of fruit and flowers, the grotesque masks are separated by elaborate strapwork, the pendentive elements of which reach nearly to the bottom of the knop and are in relief against a plain, smooth background; there is no band of acanthus leaves, as on the London version. However, the general form of the two stems is alike, even if the proportions are not identical. (v) The same may be said of the bases of the two fountains, for the differences are mainly in the chased and embossed decoration, which are clearly not by the same hand. On the Vienna fountain, the more gifted chaser has favoured a slightly more sophisticated technique by which both his marine friezes (in the upper and lower zones) are depicted silhouetted against a 'sky' or background of minute dots in concentric circles; consequently they do not have any of the details breaking across the upper edges of the friezes. His friezes of marine monsters also contain birds (including a swan), a turtle, seahorses and even one mermaid. In addition, the Vienna fountain has a less plain area separating the upper and lower tiers, for a raised moulding encircles the waist of the concave zone and, below, a chased laurel wreath provides a more finished look to the lower tier. The laurel wreath, however, is very similar in detail to that found on the underside of the base of the London fountain, where it is used to frame the large roundel of chased and embossed fruit, vegetables and flowers - a feature that does not exist on the Vienna fountain. The underside of the Vienna fountain's base is left plain. (vi) Both fountains have two strap-mounts, one on either side of the Seychelles nut, and on each fountain they are attached to the rim-mounts and the oval calyx by 'hinge fastenings' of similar design. However, there are certain unexpected technical differences. Firstly, the Vienna calyx has two thumb-shaped plates of silver soldered on to the inside of the calyx on either side where the two 'hinge fastenings' are attached - as if to provide additional strength. This is not the case with the London fountain. Secondly, the strap-mounts on the Vienna fountain have a double thickness because each has a backing plate of silver that hides from view the reverse of the embossed design of the strap-mounts. These backing plates, apart from having crudely fashioned square holes (two on one strap and one on the other - perhaps for constructional reasons), are not entirely plain: towards the bottom, they extend beyond the embossed strap-mount itself and create, firstly, the two fishtails (on either side of the two entwined serpentine forms) and, secondly, the flaccid leaf-motif decorated with dots (between the end of the strap-mount and the 'hinge fastening' on the calyx). Consequently, the Vienna and London strap-mounts look different but the main parts are identical; however, on the Vienna fountain they have been strengthened and altered by the addition of the back-plate which has made them a little longer - no doubt to accommodate the slightly more rounded form of the Seychelles nut. (vii) The marine subjects embossed and chased on the calyx of the Vienna fountain again include a greater variety, even attempting representations of the human form with a Neptune and mermaid group (at one end) and a sea-monster and nymph (at the other end). The depiction of the turbulent water is more accomplished on the London fountain, where the wavy outline is also bolder. As on the upper tier of the base, the marine scene on the calyx of the London fountain continues closer to the centre, so that the rim of the stem overlaps and rests on the top of the embossed design. (viii) The more complex strapwork and scrolling engraved pattern on the vertical surfaces of the rim-mount on the Vienna fountain is, however, not executed with particular skill. Indeed, when compared with the London version it has been extended downwards, with less visual logic or harmonious effect, to fill the irregular shaped space where the nut dips steeply (at the centre front). (ix) The spout on the Vienna fountain is composed of a short tube issuing from flutings forming the lower part of an animal mask, the top of which projects far above the rim-mount. This poor design is further confused by the small shell resting on top of the mask and extending backwards over the horizontal rim-mount, leaving only a tiny gap between the shell and the rim-mount. Internally, the spout is fastened by cutting slits in the tube and folding back the short sections over a silver circular washer. In consequence, it is not designed as a detachable spout and does not correspond with the simple but far more effective London version. (x) The covers of the two fountains are similar, despite having a slightly different outline. On the Vienna cover, the goldsmith has created a more complex frame to the marine scene on the flat-domed area. Within the laurel-wreath border (with three strapwork elements and three groups of berries where the laurel leaves laid in one direction meet those laid in the opposite direction), he has added a narrow, plain strip and a slightly wider strip ornamented with a repeating pattern of four separate motifs (a pyramidal diamond/a double triangle/an oval/a double triangle). Again, he has introduced more variety into the subjects of the marine scene, including two swans, a large bird catching an eel, scallop shells, several tall plants and rushes - the latter silhouetted against the 'sky' or background of minute dots in concentric circles - and two scallop shells in the centre. (xi) Finally, the similarities and differences between the two damaged central raised roundels (on the two covers), where the lost finials were once attached, have been discussed under Condition; but, in addition, attention should here be drawn to the unexpectedly prominent depiction of swans (one on the foot and two on the cover of the Vienna fountain) within the embossed and chased marine scenes that are otherwise filled with fantastical and monstrous fish. The choice of a swan for the finial figure of this Vienna fountain would, therefore, seem not to have been inappropriate or accidental. The conclusion reached at the end of the 1981 comparative study session was that if the Vienna fountain (inv. no. 68.49) was to be identified with the one described on folios 488-9 of the 1821 Inventory of the Ambras Collection in Vienna (‘Inventar der K.K. Ambraser Sammlung in Wien, 1821’, which is now preserved in the Sammlung für Plastik und Kunstgewerbe, Kunsthistorisches Museum, Vienna, inv. no. 6675), then it only entered the Hapsburg Schatzkammer in Vienna in 1871, when it was accepted and signed for by Dr Leitner, the Director; and that only in 1891, when the Kunsthistorisches Museum was established, was it removed from the Private Apartments of the Hofburg and placed in the Schatzkammer itself. Consequently, there was a period in the late nineteenth century when it might have been repaired and regilded - perhaps after 1885, when it was noted that the broken swan finial figure from the cover had been completely lost - and at that stage it was again returned for display in the Private Apartments of the Hofburg. The Ambras Collection, the nucleus of which was the creation of the Archduke Ferdinand II of Tyrol (1529-95), does not have a totally documented history because, although fourteen inventories of the collection were made between 1596 and 1875, it is still impossible to establish when certain objects were transferred from Vienna (where they had been previously documented) to Ambras, where they suddenly appear in the records. Furthermore, in 1806 large parts of the collection had been removed from the Schloss Ambras in Innsbruck, when they were under threat from the forces of Napoleon and Bavaria, to the safety of Vienna where they were housed in the Lower Belvedere palace as 'The Imperial and Royal Ambras Collection'. The identification of particular objects in the Ambras inventories is made more difficult by the very summary or incomplete descriptions and by the complication that the cabinets were often numbered differently from one inventory to another. Consequently, the inclusion of the Vienna fountain (inv. no. 68.49) in the 1821 Inventory of the Ambras Collection in Vienna would not rule out the possibility that the Vienna fountain had originally been listed in the 1607-11 Inventory of the Kunstkammer of the Emperor Rudolph II (a manuscript in the Library of the Reigning Prince of Liechtenstein, which was recently edited by R. Bauer and H. Haupt and published in ‘Jahrbuch der Kunsthistorischen Sammlungen in Wien’, LXXII, 1976). Indeed, most recently Dr Trnek has tentatively identified the Vienna fountain with item 295 in the 1607-11 Inventory, which reads: “I ander cocco de maldiva, mit silber gefasst zu einem trinckhgeschirr, vornen mit einem rörlin” (see H. Trnek, in ‘Prag um 1600’, Vienna, 1988, p. 215, no. 687); furthermore, he has described its silver-gilt mounts as the work of an unknown goldsmith, active in Southern Germany during the last quarter of the sixteenth century. Although the London fountain is clearly not decorated by the same embosser and engraver, both the Vienna and the London fountains seem so closely related that they probably originated in the same town, where castings from the same mould - like the vertical strap-mounts with female terms - could be purchased from the one specialist craftsman. Such a town might have been Augsburg, where numerous goldsmiths flourished at this time under lavish patronage, both from the Imperial Court and from the wealthy German princes, and where a specialist division of labour was much favoured. 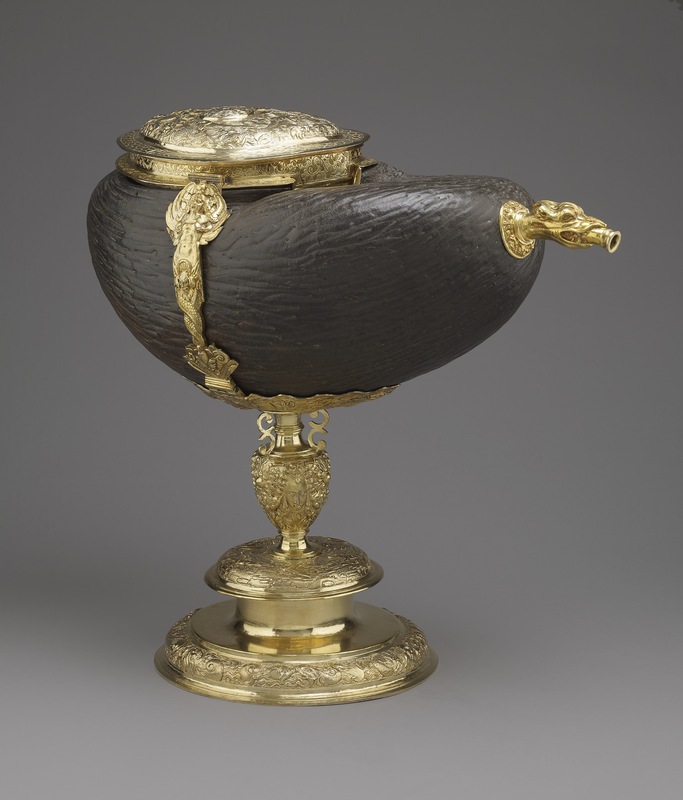 Furthermore, the Seychelles-nut ewer from the Kunstschrank of Gustavus Adolphus of Sweden, which was made in Augsburg between 1625 and 1631 (now preserved in Uppsala), has two vertical strap-mounts (on either side) of similar - though not identical - design. The rigid guild system for the training of apprentices, the popularity of certain decorative motifs - like these terms - and the strongly conservative tastes of many German patrons during the first quarter of the seventeenth century led to Augsburg craftsmen (in various fields, such as clockmaking and goldsmiths' work) becoming more and more repetitive. Consequently, the evidence of the Uppsala ewer of 1625-31 does not necessarily preclude a late sixteenth-century dating for both the Vienna and the London fountains, which in 1981 were recognised and published for the first time as being closely related, perhaps even companion, pieces (Tait 1981, p. 71, col. pl. XIIIB). Indeed, it was even suggested that the two halves of the same Seychelles nut could have been used to create these two very similar, but individually decorated, fountains; however, it was recognised that the question of the identity of the workshop that created them would have to remain unanswered because neither was hallmarked. In Fritz 1983, the Vienna fountain (inv. no. 68.49) was neither listed nor illustrated, whereas the London fountain was listed and tentatively attributed to Augsburg at the end of the sixteenth century. An Augsburg workshop continues to be regarded as the most likely origin, for the popularity of the draped female mask in relief- as used on the knop of the stem of the London fountain - is well attested on several works by the Augsburg goldsmith Theophil Glaubich, who died in 1572 (see Tait 1988, pp. 153-60, fig. 151, where Glaubich's double standing-cup in the Moscow Kremlin, his standing-cup in the Vatican Museum, Rome, and his closely related example in the Liechtensteinisches Museum in Vaduz are all compared with the slightly later draped female masks on the double standing-cup by Kornelius Erb, who died in Augsburg in 1618). Furthermore, the marine scene incorporating writhing monstrous fishes and sea-creatures, popularised by du Cerceau, Cornelis Floris and Cornelis Bos in the 1540s, was at the height of its popularity with the Mannerist Courts of Europe during the second half of the sixteenth century. In conclusion, the Deutsches Ritter Ordens fountain in Vienna may predate the Vienna and London fountains, but all three seem to be rare survivals from the last quarter of the sixteenth century. Dora Thornton, 'A Rothschild Renaissance: Treasures from the Waddesdon Bequest', British Museum, London, 2015, pp.260-263.